The House has voted to rush an additional $2 billion into the popular but financially strapped "cash for clunkers" car purchase program. The bill was approved on a vote of 316-109. House members acted within hours of learning from Transportation Secretary Ray LaHood that the program was running out of money. The absolute insanity of this is just staggering. Transit is starving, Amtrak is wheezing, bicyclists and pedestrians lack adequate facilities, yet the government happily tosses billions and billions of (borrowed) dollars at motorists. It's like a giant national Oprah show: "Everyone gets a new car!" Worst of all, it appears the environmental advocacy community completely laid down for this. I even got a message from the Sierra Club: "Put Cash for Clunkers to Good Use." Where's the environmental benefit? The 1,000 gallons or so of energy "embedded" in the prior manufacture of the existing clunker will be scrapped, so the new more fuel efficient consumer can save maybe 50 gallons a year? Huh? Sustainable transportation advocates have long been frustrated by the failure of mainstream environmental organizations, obsessed with fantasies about clean energy or efficient vehicles. Transit has been on the chopping block everywhere, with negligible opposition from environmentalists. If Congress wants to save jobs with some subsidy to the auto industry, we should demand concessions. Say a $1-a-gallon surcharge on gas dedicated to transit, walking, and bicycling in exchange for this freebie to motorists. Bicycle advocates active with Sierra Club, National Resources Defense Council, League of Conservation Voters, and other enviro groups need to demand greater efforts for sustainable, not efficient transportation. Our economic future will be determined by how quickly we shift from a transportation system based on driving alone to one based on bicycling, walking, passenger rail, and public transit. "I don't know who has studied it, if anyone, but there's certainly a threshold at which you can raise the MPG standard high enough that the embedded emission costs will be outweighed by the vehicle's lifetime fuel efficiency improvements. "It's not so certain as that. There's an additional variable, how much the vehicle is driven. This depends heavily on the cost of driving it; a shiny, new, more fuel efficient car will be driven more than the old 'clunker' would have been. In the extreme case, your threshold is infinite. Families of limited means may have a fixed budget to spend on gas each month, and if they stick to this then no change in their vehicles' efficiency will affect their fuel consumption. Each time you try to account for a new real-life factor, the threshold to break even (!) with a new vehicle purchase flies further away and becomes more uncertain. Chasing efficiency is chasing a ghost of the real problem, fuel consumption. If our society is serious about reducing that then the solution is simple: raise the cost of fuel with taxes, refund it in other ways or spend it fairly (health care?). Efficiency would be a nice byproduct of this for people that like to drive, but the part that matters to the ecosystem we share would be a predictable and steady decline in overall consumption. And it wouldn't hurt our country's prospects to have some ability to mitigate the fuel price swings that will again wreck havoc on its economy." I sent a note to Feinstein and Boxer asking them to vote NO an any further funds for the clunkers program. It's great to get these so-called "clunkers" off the road, and this program is an incentive for that. But I can't help but agree that there must be some other way to incentivize people to ditch the inefficient vehicles. Maybe instead of "cash for clunkers" we should see "cash for cyclists" that would provide extra cash to someone who donates their car for re-use of the raw materials, and then also buys a commuter bicycle. Or use the money for implementation of a bike-share system. @yokota fritz - "no" might not always be practical. Give them suggestions, ranging from the outlandishly optimistic (that, if they are serious, they include in their first response, and then later give it up to show that they are willing to "compromise") to the likely and practical. So, "outlandish", what would that be? I'm thinking, Copenhagen, in ten years. Health insurance must include bicycle subsidies in long-term fitness programs (perhaps they subsidize consumables, like chains, brake-blocks, and tires). They're willing to spend hundreds of dollars per year on meds that don't raise my good cholesterol, but not a penny on the cycling that does. Insist on a per-gallon-of-gas subsidy calculation. Auto insurance to be funded by a surcharge on each gallon of gasoline. No more free parking, anywhere! And "sensible", what would that be? More money for bike paths -- bigger subsidies, and better paths in every way (better preparation, so that tree roots won't mess them up). Changes to the UVC to encourage signal/sign changes that work in Europe. Money to identify, and fix, gaps in the bike networks that already exist (my commute ends in two miles of shopping-mall and industrial-park heck). Money to communities to bring their crappy roads up to a smooth standard, IF they also make provisions for bicycles on those roads (and set standards, so that they don't cheap out with a white stripe 2 feet from the curb). Great comments dr2chase; Copenhagen is the model. I also neglected to mention the obesity epidemic and the pending healthcare crisis, which active commuting (bicycling, walking) could help combat. But I've learned never to expect sanity from Washington. Clunkers need to be eliminated via the stick (tougher inspection standards) and not the carrot (subsidies). Absolutely agree. I've cobbled together a list of reasons why I think any fuel efficiency gains will be far outweighed by other unforeseen factors. I also think you are right to go after the environmentalist groups on this one. Michigan and the South are going to want the manufacturing jobs, and lots of people appreciate free money. They won't be convinced by reason or ethics (the whole "grandchildren's money" thing is not what you want to hear while you're driving a new car). But the Sierra Club should know better, and it makes me sad that they had their members write letters for this. Maybe this could be a watershed moment for them, where they realize putting their political capital into motoring-only is not the best way to achieve their own goals. Given that millions of cars are going to be sold each year for the forseeable future, the most troubling thing about this legislation is that it could not require truly significant increases in fuel consumption for qualified vehicles (say approaching 50 mpg). Since the US automakers don't sell such vehicles in this country, there would be no boost to the domestic auto industry from such a bill. The US automakers do sell cars that get 50 mpg in Europe for one simple reason--they have a gas tax with teeth. The problem is, that except for some of us on the fringe, bicycles are toys, and Copenhagen is not local America. When buying a Bike makes a family feel confident about the future, and there is a bike Manufacture that is "too big to fail", and our niche market supplies jobs for 10% of the American workforce, then this argument makes sense till then we cyclists are on our own, and will continue to be marginalized. Sadly, I believe the CFC program was created more to benefit the struggling auto industry than do anything for the good of the environment or safety of the roads. Apparently, it's working. I am curious to see a study on the program that shows how many people who couldn't really afford a new car have gone further into debt to get a new one, and how many instances like this trade of a Ford F150 for a Chevy Silverado are taking place. KQED's "Forum" program this morning discussed the Cash for Clunkers program. They had a car dealer lobbyist on one side and economist Jeff Miron on the other side. I think Miron argued convincingly against Cash for Clunkers, but many callers weighed in on the environmental "benefits" of trading in the 18 mpg clunker for a 24 mpg newer car. @dr2chase: Certainly; I didn't post my entire note to Senators Boxer and Feinstein (who now support the Cash for Clunkers program) here. It's important to remember also that when communicating with politicians and with journalists, it's vital to stay on point, or your message gets diluted and lost. Miron gave his suggested alternative: If people are serious about an environmental benefit, we need to raise the gas tax. and there is a bike Manufacturer that is "too big to fail"
But this would never happen, and this may be an intrinsic problem to bicycling. Bikes are so much cheaper and more efficient than cars, that you could not possibly build a too-big-to-fail industry around them. On the other hand, a big shift to cycling, could hit some existing industries pretty hard. Suppose, hypothetically, that bikes suddenly hit at 25% commute/trip/ride share -- who loses money? - auto manufacturers, because people will buy fewer cars (their cars will last at least 25% longer). - oil industry, because people will burn less gasoline. - drug companies, because there will be a corresponding reduction in medication for high blood pressure and cholesterol. Other meds may be affected, I'm not entirely sure. Problem we've got is, if we shift to a radically more efficient means of transportation, that all the people who previously supported the inefficient transport, will have to find something else to do. That's hard, they'd much rather lobby their elected representatives to keep the gravy flowing. Yes, but if 25% of all trips were now on bikes other indistries would grow, such as clothing indistries, better health care, longer vacations and even higer educations with all the money redirected. So, America would not in any way suffer. And add that America becomming a more friendly country tourism could grow. Nice to see a post from you again. This blog has been sleeping since the book. I'm so glad to see this! How about a government program that gives you money for a bicycle and/or a transit pass??? Doesn't anyone in government get the connection between our health care costs and our support of the automobile-centric lifestyle? That was a great post. Thank you. Interestingly, I just came across this story from the UK: Government says 'no' to scrappage scheme for bicycles. Apparently the UK's Environmental Transport Association responded to that country's version of Cash for Clunkers by proposing a "Pounds for Pedals" program: consumers would be given £100 for a new bicycle, with the old one being sent for refurbishment in the developing world. The Prime Minister rejected the plan. Same as the old boss, etc. Portland bike shop offers Cash for Clunkers. delighted to that conservatives and liberals are agreeing that this administration is out of control. I don't think it's just "this" administration. The bi-partisan consensus has favored and privileged automobiles for more than 60 years. The "cash for clunkers" nonsense is more "consistency" than "change" from this particular administration. From "Cash for Clunkers didn't boost hybrid sales" in the Sacramento Bee, 08.18.09: It's less clear what the trade-in program has accomplished on the environmental front. Much to the chagrin of public-interest groups, a fair number of U.S. consumers are turning right around and buying new light trucks with their credits from the Car Allowance Rebate System, or CARS. "It appears that despite some of these glowing (federal) reports we've seen on the environmental benefits of the program, a lot of light trucks and SUVs are being purchased through the program," said Lena Pons, a policy analyst Public Citizen, the Washington, D.C.-based advocacy group. Wow. Here in Italy the government set up a subsidised programme to support the purchase of new bikes. The money flew out the door, to the point that it ran out and they are only starting it up again this fall. I wonder what impact could have been made with a few pennies from the cash for clunkers programme targeted exclusively to bikes? 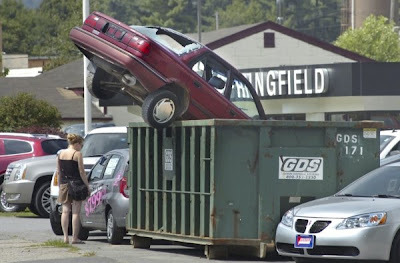 Love the photo of the clunker poking outta the top of the dumpster. If I was the king of the world, I tell you what I'd do. I'd throw away the cars and the bars and the wars and make sweet love to you. I completely agree. It is ridiculous to throw money into cars when we really need to be building livable communities by creating a REAL infastructure (i.e. bike lanes, side walks, mass transit). the mainstream american love of cars is so sad. i like this blog. being a college student, i don't have a car and i bike or take public transit to get around. i'm also proud to say i have a mom who takes the subway to work and a dad who bikes! so you know, there's hope. I just stumbled on your post and it really struck a chord with me. Here in the UK we have a similar system where the government is subsidising a scheme which gives you £2000 off the price of a brand new car if you trade in your 10 years+ old model. There are so many flaws with this that it's untrue. As far as the environmental argument goes, surely leaving people running older, smaller cars is more sensible than the MASSIVELY damaging (in terms of carbon emissions) process of making a new car (not to mention getting it to the UK after it's been made). Finally, there was so much more they could have spent their cash on. We live in a tiny country. Our cities are so densely packed in that in reality nowhere is very far from anywhere else, so why aren't we cycling. Cash on providing cycling lanes and traffic calming measures to make life safer for cyclists would surely have been better spent. I'd have given the money to these mountain bike guys- they'd use it more wisely. Now that we know more about the morons running the government, this is much more understandable a year later. Greeting from NYC. Great blog! I know this topic can get deep and I have to tell you great pic! Is that photo real or photoshoped! Its a difficult one with the idea of the program to bring cash into a stale market while potentially ignoring the fact there are already just too many cars about. I'm in agreeance with the majority of the people here. The system seems like a nice one. Getting low MPG cars off the road will definitely help, but not to the point where we need to give them that much money. There's a point where there are more important things to be doing to make ourselves a greener country.